What most Yanks don’t know about British lube shouldn’t be put in a grease fitting. But nobody’s blaming anybody, y’understand. It’s just that the needed information hasn’t been correlated and circulated up to now. The great day, however, dawns right here on this page. So you lads in England, Italy, North Africa. India, and other Anglo—American theaters, can stop writing these poignant essays on bewilderment we keep finding in our mail. Take heed, too, all you other drivers and mechanics — even if your vehicles happen to be parked right next to a Texas oil well. Nobody’s handing out any written guarantees that you won’t be pumping petrol somewhere in Iran before you can say “detergent additive.” So the table below is A Good Thing To Know. 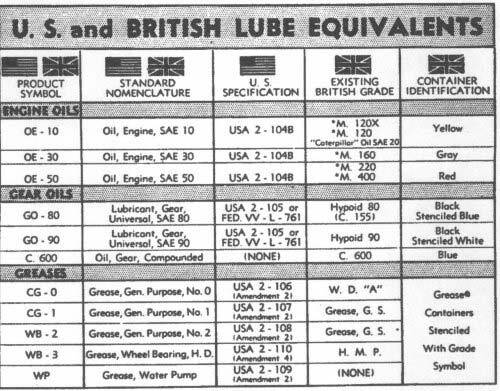 The news-behind-the-news: This list of lube equivalents represents an important agreement between the U. S. and British armies. Its purpose of course, is to standardize basic lubricants and containers to permit easy interchangeability of petroleum supplies, and to minimize the number of different oils and greases required in any one theater of operations. The lube types and grades identified below are the most commonly used by both armies. All are substantially interchangeable as indicated — with this notable exception: GM and Caterpillar diesel engines must use only oils which contain approved heavy duty additives (the existing British grades of engine oil do not). All other U. S. Army vehicles will take to British lubes like a DUKW to water. In cases where extra-special lubes are called far, chances are that the Tommies can fill your bill, too —- because British Area Petroleum Offices are kept wise to the exact lube specifications for U. S. Ordnance materiel. Which doesn’t, of course, excuse any blissful ignorance on your part. Paste this chart in your hat — or, better still, in your head —- for present or future reference.